For a timeline of the campaign, see the timelines of Real IRA actions, Continuity IRA actions and Óglaigh na hÉireann actions. The dissident Irish republican campaign began at the end of the Troubles, a 30-year conflict in Northern Ireland. Since the Provisional Irish Republican Army (IRA or PIRA) called a ceasefire and ended its campaign in 1997, breakaway groups opposed to the ceasefire and to the peace agreements ("dissident Irish republicans") have continued a low-level armed campaign against the security forces in Northern Ireland. The main paramilitaries involved are the Real IRA, Continuity IRA and Óglaigh na hÉireann. They have targeted the Northern Irish police[N 8] and the British Army in gun and bomb attacks, as well as with mortars and rockets. They have also carried out bombings that are meant to cause disruption. However, their campaign has not been as intensive as the Provisional IRA's. A political map of Ireland, with capitals highlighted. In 2007, the government declared the end of Operation Banner, ending the four-decade long deployment of the British Army in Northern Ireland. As a result, the Police Service of Northern Ireland (PSNI) has since been the main target of attacks. To date, two British soldiers, two PSNI officers and two Prison Service guard have been killed as part of the republican campaign. At least 50 civilians (and former combatants) have also been killed by republican paramilitaries, 29 of whom died in the Omagh bombing carried out by the Real IRA. Since the 1169 invasion of Ireland by Norman knights at the request of ousted King of Leinster Dermot MacMurrough, Ireland has, in part or in whole, been under English, and later British, administration. Rebellions against rule from Great Britain were unsuccessful until 1919–1921's Anglo-Irish War, when the original Irish Republican Army (IRA) succeeded in removing 26 of Ireland's 32 counties from the United Kingdom of Great Britain and Ireland as the Irish Free State. Although previously, the offer of Irish Home rule was agreed in the third Home Rule Bill, implementation was suspended by violent opposition in Ulster and the forming of the UVF, and later by the outbreak of the First World War. 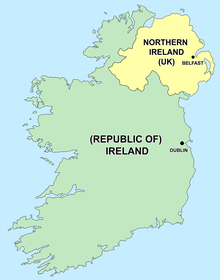 Following the partition of Ireland by the Crown, the remaining six counties, located in the province of Ulster, became Northern Ireland and remained a part of the renamed United Kingdom of Great Britain and Northern Ireland. A civil war followed in the new southern state, and the IRA split for the first time, into the Irish National Army—the war's victor, which became the army of the Free State—and the Anti-Treaty IRA, which was opposed to the treaty that had partitioned Ireland into two states. The IRA ceased to be a significant force following its defeat in the Civil War, and it was not until a further split, into the Official IRA and Provisional IRA (PIRA) following the 1969 Northern Ireland riots, that a group calling itself the Irish Republican Army—the Provisional IRA—would again come to prove a significant military force. As a belligerent in what would come to be known as the Troubles, the PIRA waged an armed campaign against the British state that lasted until 1997 and claimed around 1800 lives. The PIRA called an indefinite ceasefire in 1997 and decommissioned its arms in 2005 in accordance with the 1998 Good Friday Agreement, but a number of hardline splinter groups, known as dissident republicans, have vowed to continue using "armed struggle" to achieve the republican aim of a united Ireland. Motivations for continued violence vary by group; for the more conservative Continuity IRA, the Provisionals' ending of abstentionist politics at the 1986 General Army Convention (GAC) served as a catalyst for tension. For ONH; the acceptance by the Sinn Féin special Ard Fheis of the PSNI and the Real IRA's "criminality", whilst for the majority of Dissident Republicans and the RIRA/NIRA the cause was the Belfast Good Friday Agreement. In August 1994, the Provisional IRA called a ceasefire. In January 1996 the Continuity IRA announced its existence and vowed to continue the armed campaign against British rule in Northern Ireland. A month later, the Provisional IRA called-off its ceasefire because of its dissatisfaction with the state of the peace negotiations. On 13 July, the CIRA detonated a car bomb outside Kilyhelvin Hotel in Enniskillen, County Fermanagh. The blast caused serious damage and injured 17 people as they were being evacuated from the hotel. Over the following year it planted another three cars bombs in Belfast, Derry and Fermanagh, but all were defused by the British Army. The Provisional IRA called a second ceasefire in July 1997. On 16 September 1997, the CIRA detonated a van bomb outside the Royal Ulster Constabulary (RUC) base in Markethill, causing widespread damage. The bombing happened a day after Sinn Féin joined the political negotiations which led to the Good Friday Agreement. In November 1997, high-ranking Provisional IRA members who opposed the ceasefire formed a breakaway group that would become known as the Real IRA. During the first half of 1998 the Real IRA and Continuity IRA launched a string of car bomb and mortar attacks on RUC bases. There were car bombings in Moira on 20 February and in Portadown on 23 February. There was a mortar attack on Armagh RUC base on 10 March, and on two British Army bases in South Armagh on 24 March. On 10 April, after two years of intensive negotiations, the Belfast Good Friday Agreement was signed. Further mortars were launched at RUC bases in Belfast on 4 May and Belleek on 9 May, but missed their targets. On 22 May, referendums on the Agreement were held in Northern Ireland and the Republic of Ireland. In Northern Ireland, the vote was 71% in favour, while in the Republic the vote was 94% in favour. On 24 June, the Irish National Liberation Army (INLA) detonated a car bomb in Newtownhamilton. On 1 August, following a telephoned warning, a RIRA car bomb detonated in the centre of Banbridge, injuring two RUC officers and 33 civilians. On 15 August 1998 the RIRA left a car containing 500 lb of home-made explosives in the centre of Omagh, County Tyrone. The bombers could not find a parking space near the intended target of the courthouse, and the car was left 400 metres away. Three inaccurate telephone warnings were issued, and the RUC believed the bomb was actually located outside the courthouse. They attempted to establish a security cordon to keep civilians clear of the area, which inadvertently pushed people closer to the actual location of the bomb. Shortly after, the bomb exploded killing 29 people and injuring 220 others, in what became the deadliest attack of the Troubles inside Northern Ireland. The bombing caused a major outcry throughout the world, and the Irish and British governments introduced new legislation in an attempt to destroy the organisation. The RIRA also came under pressure from the Provisional IRA, when Provisional IRA members visited the homes of 60 people connected with the RIRA and ordered them to disband and stop interfering with Provisional IRA arms dumps. With the organisation under intense pressure, the RIRA called a ceasefire on 8 September. Following the Omagh bombing, there was a lull in dissident republican activity; mainly due to the RIRA ceasefire and the arrests of prominent dissident republican militants. The RIRA used the ceasefire to re-group and re-arm. Meanwhile, the CIRA carried out a number of minor attacks. The Real IRA called off its ceasefire in January 2000, declaring: "Once again, Óglaigh na hÉireann declares the right of the Irish people to the ownership of Ireland. We call on all volunteers loyal to the Irish Republic to unite to uphold the Republic and establish a permanent national parliament representative of all the people". There was a surge of activity over the next two years. During this time, republicans carried out a series of bomb and mortar attacks on British Army and RUC bases, including a car bomb attack on Stewartstown RUC base in July 2000. That November, an RUC officer lost a leg when a booby trap bomb exploded outside Castlewellan RUC base. In June 2001, the Real IRA opened fire on RUC officers at a polling station in Ballinascreen, wounding two officers and a civilian. It was thought to be the first close-range gun attack on officers since 1997. The Real IRA also carried out a number of bombings in London during 2000–2001; the first republican attacks there since 1997. In June 2000, a bomb damaged Hammersmith Bridge and in September an RPG-22 rocket struck the SIS Building, headquarters of the Secret Intelligence Service, also known as the MI6. In February 2001 a British Army cadet lost a hand when a booby-trap bomb exploded outside his barracks in west London. The following month a car bomb exploded outside the BBC Television Centre, after a telephoned warning. Another car bomb that exploded near Ealing Broadway station in August left extensive damage in the area. In November, a third car bomb partially exploded in Birmingham city centre. In November 2001, the Royal Ulster Constabulary (RUC) became the Police Service of Northern Ireland (PSNI). The reform of the RUC had been a main demand of Irish republicans and nationalists. However, Sinn Féin—the main republican party—refused to support the PSNI until the reforms were fully implemented. Dissident republicans made clear that they would never support a "British paramilitary police force" in any part of Ireland. In August 2002, a booby-trap bomb exploded at a British Army base in Derry. It killed a civilian contractor—a former British soldier—who was working at the base. On 17 August 2003, the RIRA killed Danny McGurk, a civilian, in West Belfast. The group later issued a statement offering an apology and saying that the killing was "criminally wrong and detracted from the goal of Irish liberation". Over the following few years, dissident republican activity gradually waned. This was mainly due to internal tensions and police actions. There were splits within the paramilitary groups, especially within the Continuity IRA. In 2006, a group calling itself Óglaigh na hÉireann or ONH emerged; over the following years it would become the most active republican paramilitary after the RIRA. In 2005, the mainstream IRA—having been on ceasefire since 1997—formally ended its campaign and decommissioned its weapons. In 2007, following the St Andrews Agreement, Sinn Féin finally voted to support the PSNI. Some of Sinn Féin's support base opposed these moves. They believed Sinn Féin had "sold out" and was moving closer to accepting the "British occupation". This led to more republicans lending their support to dissident groups. Following the IRA's declaration, the British Army greatly reduced its presence in Northern Ireland and left the PSNI in charge of security. In March 2009 came the first security force fatalities since the end of the Troubles. The Real IRA shot dead two British soldiers as they collected a delivery outside Massereene Barracks in Antrim. Two other soldiers and two civilian deliverymen were also wounded by gunfire. Two days later, the Continuity IRA shot dead a PSNI officer responding to a call in Craigavon. This began the most intensive period of dissident activity since the campaign started. The number of attacks has risen each year, with 118 attacks in 2009, 239 the following year and a higher number the year after that. On 12 April 2009, the RIRA claimed responsibility for shooting dead MI5 informant Denis Donaldson on 4 April 2006, at his cottage near Glenties, County Donegal, Republic of Ireland. 2010 saw the first car bombings in Northern Ireland in a decade. The first exploded outside the courthouse in Newry in February; a second exploded outside Palace Barracks (the NI headquarters of MI5) on 12 April; a third exploded outside Newtownhamilton PSNI base on 22 April; in August a fourth exploded outside Strand Road PSNI base in Derry; and in October a fifth exploded outside a bank in the same area, causing widespread damage. Also that year, a PSNI officer had to have his leg amputated after a booby-trap bomb exploded under his car. In April 2011, another PSNI officer was killed when a booby-trap bomb exploded under his car in Omagh. It was announced in July 2012 that Republican Action Against Drugs (RAAD) and a number of other small republican groups were merging with the Real IRA. The CIRA and the group calling itself ONH were not included in the merger. Some in the media referred to the grouping as the "New IRA". In November, the group shot dead a Prison Officer on the M1 motorway. The shots were fired from another car, which drove alongside his. He was the first Prison Officer to be killed since 1993. In May 2013 Christine Connor twice attempted to bomb Police Service of Northern Ireland patrols by luring them with false calls to a house on Crumlin Road, Belfast. Shortly after, the British Government announced that the 39th summit of the G8 would be held in June 2013 at the Lough Erne Resort in Fermanagh. Commentators said the British Government chose to hold it in Northern Ireland partly to "show the world that the peace process has worked and normality has returned". Security sources believed republicans would try to launch an attack during the summit, which "would hijack global headlines". In March 2013, a car bomb was defused near the resort. ONH said it had planned to detonate it at the hotel but had to abort the attack. A huge security operation was mounted for the summit and it passed off without incident. In the run-up to Christmas 2013, there was a surge in dissident republican activity. This included the first bombings in Belfast city centre in a decade. On 25 November a car bomb partially exploded outside Victoria Square Shopping Centre and a PSNI base. A man was forced to drive the bomb to the spot and raised the alarm. On 13 December a small bomb exploded in a holdall outside St Anne's Square, following a telephoned warning. Nobody was hurt in the attacks, which were claimed by ONH. Also in December, two PSNI patrols were the target of automatic gunfire in Belfast. In February 2014 the Real IRA (or 'New IRA') sent seven letter bombs to British Army recruitment offices in south-east England; the first time republican militants attacked inside Great Britain since 2001. The following month, a PSNI land rover was hit by a horizontal mortar in Belfast. A civilian car was also hit by debris, but there were no injuries. It was the first successful attack of its kind in more than ten years. A PSNI armoured jeep was hit by another horizontal mortar in Derry that November, blowing off a door and damaging a passing car. The Real IRA said it had fired an "EFP mortar-style device". In the security operation that followed, youths attacked the PSNI with stones and petrol bombs. Two weeks later, a PSNI land rover was attacked with a homemade rocket-propelled grenade (RPG) launcher on Crumlin Road, Belfast. The warhead pierced the land rover's outer shell. In November 2015, a PSNI vehicle was riddled with automatic gunfire in Belfast. The attacker was later charged with attempted murder. A booby-trap bomb detonated under a van driven by a prison officer, Adrian Ismay, on 4 March 2016. He died 11 days later. The 'New IRA' claimed responsibility and said it was a response to the alleged mistreatment of republican prisoners at Maghaberry Prison. A new dissident terror group calling itself Arm na Poblachta (meaning 'Army of the Republic') claimed responsibility for planting a roadside explosive device in Belfast on 1 November 2017. On 19 January 2019 there was a car bomb attack on a courthouse in Derry, the first such attack in several years. In March, several letter bombs were found at Heathrow Airport, London City Airport and Waterloo station; the 'New' IRA claimed responsibility. On 18 April 2019, rioting erupted following police raids in Derry, during which a gunman opened fire on the PSNI, killing journalist Lyra McKee. The PSNI believe the 'New IRA' were responsible. ^ Succeeded by the PSNI. ^ Since then, only in a minor capacity with its bomb disposal expertise (Operation Helvetic). ^ Disbanded due to internal disagreements. ^ Merged into the NIRA. ^ According to the CAIN. ^ 1 by Gardai, 1 by gangs, 1 in PSNI custody, and another by PIRA. ^ Police Service of Northern Ireland (PSNI), successor of the Royal Ulster Constabulary. ^ Allan Preston (7 February 2017). "Outrage as Northern Ireland bomb disposal heroes denied bravery medal". belfasttelegraph.co.uk. Retrieved 4 February 2019. ^ "Rows tear Republican group apart - Herald.ie". ^ "Nine jailed over Continuity IRA training camp". ^ "Nine men to stand trial over meetings where dissident attacks allegedly planned". The Irish News. ^ "Arrests over Strabane explosion". 28 May 2010 – via www.bbc.com. ^ McKittrick, David (19 August 2009). "The Big Question: How active is the Real IRA, and what can the security forces do about it?". London: The Independent. Retrieved 15 February 2015. ^ "Long says report shows backing for Alliance's shared future ideas". Alliance Party of Northern Ireland. 3 April 2014. Retrieved 15 February 2015. ^ "A Chronology of the Conflict - 1996". Conflict Archive on the Internet (CAIN). Retrieved 15 April 2014. ^ "A Chronology of the Conflict - 1997". Conflict Archive on the Internet (CAIN). Retrieved 15 April 2014. ^ a b c d e f g h "Chronology of the Conflict: 1998". Conflict Archive on the Internet (CAIN). Retrieved 15 April 2014. ^ "Dissidents linked to NI blast". BBC. 9 July 2000. Retrieved 28 June 2007. ^ "RUC believe dissident Republicans responsible for Down attack". RTÉ. 1 November 2000. Archived from the original on 25 October 2012. ^ Darwin Templeton (8 June 2001). "Police facing fresh terror threat". Belfast Telegraph. Archived from the original on 22 July 2012. ^ "Police hunt bridge bombers". BBC. 2 June 2000. Retrieved 6 May 2007. ^ "New leads in hunt for bombers". BBC. 11 November 2001. Retrieved 3 May 2007. ^ "Dissidents blamed for army attack". BBC News. 1 August 2002. Retrieved 25 May 2010. ^ "Newshound: Daily Northern Ireland news catalog - Irish News article". Retrieved 22 November 2014. ^ "Error 404 Not Found - Rights Watch (UK)". Rights Watch (UK). Archived from the original on 4 March 2016. Retrieved 22 November 2014. ^ "Oglaigh na hEireann is now the main threat - Northern Ireland, Local & National". Belfasttelegraph.co.uk. 2 December 2010. Archived from the original on 20 July 2012. Retrieved 20 August 2013. ^ Brian Rowan (2 August 2005). "Military move heralds end of era". BBC News. Retrieved 21 March 2008. ^ "Policeman shot dead in N Ireland". BBC News. 10 March 2009. Archived from the original on 11 March 2009. Retrieved 10 March 2009. ^ Brady, Tom (24 February 2010). "Real IRA blamed for bomb blitz on Newry courthouse". Irish Independent. Archived from the original on 4 August 2012. ^ "Car bomb explodes at courthouse". BBC News. 23 February 2010. Retrieved 25 May 2010. ^ "Real IRA admits NI MI5 base bomb". BBC News. 12 April 2010. Retrieved 20 May 2010. ^ "Bomb explodes at police station". BBC News. 23 April 2010. ^ "200lb of explosives in Derry car bomb". BBC News. 3 August 2010. Retrieved 21 August 2010. ^ "Car bomb officer Peadar Heffron's leg amputated". BBC News. 13 January 2010. Retrieved 28 March 2011. ^ "Unity statement by 'IRA Army Council'". Irish Republican News. 26 July 2012. Retrieved 16 June 2013. ^ "CAIN: Issues: Violence - Draft List of Deaths Related to the Conflict in 2012". Retrieved 4 March 2016. ^ "Prison officer killed in Co Armagh shooting". RTÉ News. 2 November 2012. Retrieved 16 June 2013. ^ "'Lone wolf republican' Connor jailed for 16 years". BBC News. 20 June 2017. ^ Kearney, Vincent (20 June 2017). "Christine Connor: Swedish model to 'lone wolf dissident'". BBC News. ^ "What Makes Fermanagh an Attractive G8 Location". BBC News. 20 November 2012. Retrieved 6 June 2013. ^ "Report says New IRA is planning terrorist attack on G8 summit in Fermanagh". IrishCentral. 1 February 2013. Retrieved 25 March 2013. ^ "Terror group claims car bomb was meant for Northern Ireland G8 summit". The Guardian, 25 March 2013. Retrieved 25 March 2013. ^ "60kg car bomb partially explodes in Belfast city centre". BBC News, 25 November 2013. Retrieved 14 December 2013. ^ "Police hunt man after explosion". Belfast Telegraph, 14 December 2013. Retrieved 14 December 2013. ^ 'IRA group' sent suspect packages to army offices. BBC News. 17 February 2014. ^ Henry McDonald. "New IRA sent bombs to army recruitment centres, Met confirms". the Guardian. Retrieved 4 March 2016. ^ "IRA warns public to stay away from PSNI targets as it launches fresh bid to kill", irishmirror.ie, 6 November 2014. ^ "Creggan Heights: Police attacked during security operation in Londonderry", BBC.co.uk, 4 November 2014. ^ "Belfast shooting 'attempt to kill police officers'". BBC News. Retrieved 4 March 2016. ^ "Adrian Ismay death: Christopher Alphonsos Robinson charged with murder". BBC News. Retrieved 10 September 2016. ^ "CCTV released following Lyra McKee murder". BBC News. Retrieved 19 April 2019.